You now have the option of adding an email collection question at the start of the HRAs for email remarketing. Then, if a user drops-off midway through, you can send a reminder email to them to come back and finish. We think this ability to use email remarketing is a big leap forward. 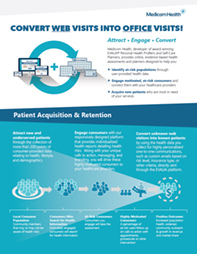 We are always looking for ways to help you improve patient conversion. Typical completion rates for our HRAs are anywhere from 25 to 55%. That’s pretty good! But that leaves a treasure trove of people who didn’t quite make it through all of the questions. Things come up; we get that! Swimming practice ends early, your name gets called at the dentist’s office, the person in front of you at the checkout finishes up – there are hundreds of distractions. Many of these people are still interested in completing the assessments. But it can slip their minds. How nice would it be to invite those people back to finish what they’d started? That’s where email remarketing comes in. Yes, our “best practice” recommendation is still to ask for minimal contact info at the end of the HRAs. However, we’ve found asking for email upfront isn’t a turn off to consumers. The important thing is to communicate the value of the information they will receive. Then, it isn’t a big hurdle to overcome. To enable this feature in our your HRAs, go to: Customization > (HRA) Manage Customization > Consumer Information. On the lower left side of the screen look for: “Collect email on first page of questions?” This feature is not automatically enabled so you will need to click ‘Yes,’ “Save Changes” and “Publish” before the end user will see this field in production environments. Contact your support specialist if you have any questions.